When freezing temperatures stop fall weed control plans, snow is likely more of a help than a hindrance with respect to overall weed condition. The snow layer is likely to insulate the weed leaf material from the colder conditions that follow it. That could mean you’re back spraying earlier than you would be with frost alone. Does herbicide work better after a frost? No. While cooler temperatures with daytime highs in the mid to high teens do increase movement of sugar, and with it glyphosate, to the roots of perennial weeds like Canada thistle, frost does not enhance that movement. In fact, research reports that a light frost following a week or more of ‘hardening’ at alternating 15°C and 5°C temperatures had no effect on movement of glyphosate or control of Canada thistle. However, while frost doesn’t improve control, it may not necessarily reduce control if enough healthy tissue remains to allow sufficient uptake of the herbicide. Spraying after a frost. Killing frost for weeds is hard to define since so many factors influence it. Different plants have different inherent tolerance to frost. For example, stinkweed can germinate in fall and survive the winter to grow the following year whereas a wild mustard plant will not. Weather preceding the frost may also affect frost tolerance. 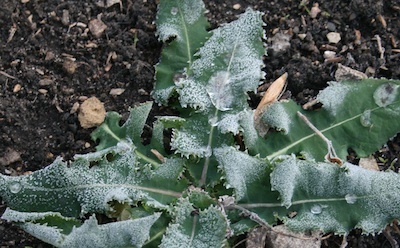 A Canada thistle plant that has had little exposure to cooler temperatures may be susceptible to a frost of as little as -3 to -4°C, whereas a plant that has gradually acclimatized to cooler conditions and progressively deeper frosts may survive a frost of -10°C or more. This is why it is critical to continually check the condition of leaf tissues before filling the sprayer. Green colour alone is not enough to determine weed health. If weeds are green, leaf tissue is still relatively pliable and the plant has signs of new growth, growers may still have an opportunity to control perennial weeds with glyphosate. To determine whether spraying after a frost is worthwhile, scout the field and check the amount of damage on the leaves. Control can still be obtained if no more than 40% of the original leaf tissue is damaged. But remember…because the amount of leaf area after harvest is only one third of what was there before harvest, even with several weeks of regrowth, using the same amount of glyphosate as in a pre-harvest application will not be effective. In reverse proportion to the leaf area, at least three times the rate used at the pre-harvest timing will be needed to get the same level of glyphosate into the plant. —Are there enough weeds to warrant a spray? —Is frost damage less than 40% of the leaf tissue? If these conditions exist, then a fall herbicide treatment may be of benefit. Tip: Even though cool weather may trigger perennials to start moving sugars downward, you still want to apply glyphosate and Group-2 herbicides on sunny and warm days for best results.